Unfortunately, the experience is all too common in the Netherlands. 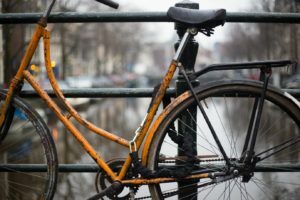 No matter what city you’re in here, bike theft is a fact of life for both internationals and Dutchies. In fact, it’s the most common criminal activity in the country, and over 600,000 bikes are stolen every year according to the RAI. The culprits are usually criminal gangs who steal multiple bikes at the same time, and once your bike is gone there’s often little hope of recovery. That said, there’s a few precautions you can take to make things difficult for would-be burglars. If you park a brand new racing bike beside a row of battered black Omafietsen in Amsterdam, it’ll stick out like a sore thumb. While less valuable bikes are more likely to be poorly locked and provide an easy target, bike thieves will put in the extra effort to make off with your €4000 racer. If you’ve got a nice bike, make sure you only bring it to and from secure locations, or save it for those long weekend journeys. Pick up a second hand bike for around €80 -150 at a street market for shopping trips and heading out to the bars at night. Then when the inevitable happens, you won’t be totally out of pocket. You may find yourself spending more on a lock than on a bike itself. This is generally a good rule of thumb when picking up a bargain basement bike. Forego the Chinese-made plastic combination lock that the market trader will bundle in with the bike and splash out on something more secure. A heavy metal chain and a (good) padlock will offer more protection than most dedicated bike locks. Stanley, Mul-T-Lock, and Abus make some very good padlocks. A solid blow from a hammer will open some cheap brass padlocks, but Abus’ Granit series locks are pick-resistant and can withstand up to 6 tons of force. Alternatively, any scooter lock that bears the ART certification mark is a safe bet for your regular pedal-powered bike. Dutch insurance companies often won’t insure scooters without one of these locks. Two locks are better than one. Using both the rear ring lock and your main lock every time you park up makes things harder for thieves. Using two main locks will deter all but the most determined thieves. How you lock your bike is as important as the lock you use. Make sure to wrap the chain through the frame of the bike as well as the wheel, and always lock your bike to something solid, like a rack, pole, railing, or fence, and if you’re out with a group of friends, use a chain to lock your bikes together. Identifying a stolen bike can be difficult. Thieves will respray and resell them as quickly as possible. Getting your bike engraved with your name can help the police find it if it’s stolen, and may deter thieves. In Amsterdam the city council provides this service at several locations throughout the city, free of charge. You can find a list of locations and opening times here. While it may often be easier to find a needle in a haystack than a stolen bike in the Netherlands, registering your bike with the police can make the search easier. Keep the receipt when you buy a bike, and fill out this police registration card. The more information the police have, the higher the chance of recovery. Stashing a small GPS tracker on your bike can make recovery a whole lot easier. Avoid tangling with thieves yourself though. Make sure to get the police involved the moment your bike goes missing. Sometimes there’s a genuine reason your bike isn’t where you left it. Bikes that have been parked illegally or for too long in one place are sometimes removed by the local council and placed in a depot. Check your local municipality’s website for details. If you’ve ever bought a rickety bike off a sketchy looking dude in the early hours of the morning for €15, you’ve bought stolen goods. Homeless people and addicts can afford shelter or drugs by selling a couple of stolen bikes a day. Even market traders sometimes move stolen bikes. Buying a stolen bike is illegal in the Netherlands, and all stolen bikes are entered into a register. Enter the make and frame number here to see if a bike was previously reported stolen, and you could save yourself a hefty fine. 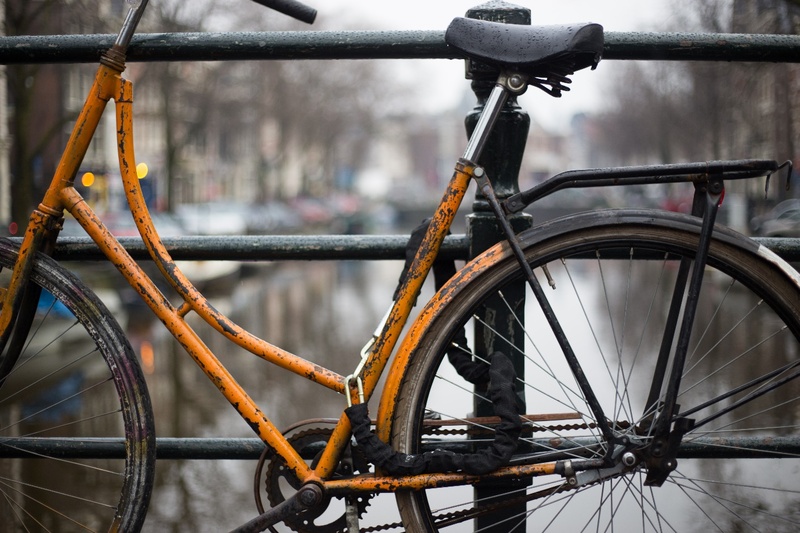 Most expats will deal with bicycle theft at some point during their stay here. But these tips can dramatically reduce the odds. Happy cycling.